Hardee Hunt and Williams Wrightsville Beach real estate company announces the property listing for 725 Schloss Street in Wrightsville Beach, North Carolina. 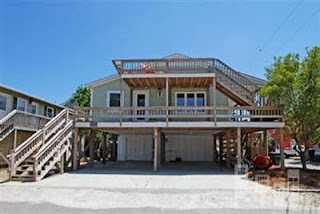 This two story cottage on the south end of Wrightsville Beach has nearby sound and ocean access with multi-units for rental and investment property opportunities. To tour the property or learn more, visit www.HardeeHuntAndWilliams.com or call 800-852-1605. 725 Schloss Street, Wrightsville Beach, N.C.
Wrightsville Beach, N.C., May 26, 2011 - The property at 725 Schloss Street in Wrightsville Beach, N.C. has been recently listed in the MLS by Hardee Hunt and Williams, a premier Wrightsville Beach real estate company (MLS# 463107). The property is located near the south end of Wrightsville Beach and is close to both the Banks Channel and ocean access points, with views of both afforded from wrap-around, bi-level exterior decks. The two story cottage at 725 Schloss Street is divided into multiple units with opportunity for primary or secondary home residence as well as investment property rental income. The property at 725 Schloss Street is in the Seaforth community of Wrightsville Beach close to ocean access points #37 and #38 as well as the Banks Channel on the western shore of the barrier island. The home is currently divided into multiple units and is ideal as a residence plus rental unit or as an investment property. The house sits on a corner lot with covered parking for four vehicles and has had recent updates including long lasting fiber cement siding, all new windows, interior doors, and top level observation decking. The upstairs level holds three bedrooms with two ceramic tiled baths and ample entertaining space with recent bamboo flooring, a coastal cabinet package, and water views from the living room and kitchen. The downstairs level has two bedrooms with one full bath and features a timeless brick patio and an ergonomic interior layout. Hardee Hunt and Williams is a premier Wrightsville Beach real estate company, specializing in Wrightsville Beach condos, homes and oceanfront properties for sale as well as Landfall and Figure Eight Island real estate. As a boutique firm, they have the focus, knowledge, and experience for listing and selling Wrightsville Beach properties as well as matching house hunters with their ideal homes on the island or in the area. Agents Jim Hardee, Ronnie Hunt, Randy Williams, and Ace Cofer are immersed in Wrightsville Beach life and the local real estate market and are dedicated agents offering personalized service for each and every real estate client. The agents at Hardee Hunt and Williams are pleased to announce the listing of 725 Schloss Street and believe the location and nature of the property make it a valuable investment for the right buyer. To watch a virtual tour of the property, visit http://youtu.be/CYevYFd49zc. To schedule a tour or to learn more about 725 Schloss Street in Wrightsville Beach, visit www.HardeeHuntAndWilliams.com or call 800-852-1605.